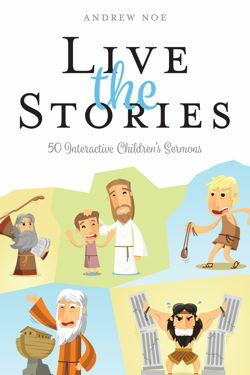 Live the Stories: 50 Interactive Children’s Sermons by Andrew Noe provides church leaders a practical guide to teaching children during the worship service through play—and invites the rest of the congregation to join the fun. Noe’s lessons allow children to play, laugh, and act out the stories of our faith and turn the sanctuary into a living testimony to what God has done in the past, is doing in the present, and will do in the future. As they learn the stories and grow, our children will develop in their faith. Andrew Noe is the director of Faithways Academy at Georgetown College in Kentucky, and the creator and content director for youthministryconversations.com. He enjoys superheroes and trying to be funny. He is married to the wonderful and amazing Hannah Noe, and they have a beautiful daughter named Gwendolyn as well as a new addition to their family, a son named Benjamin. They also have a super-intelligent dog named Daphne and a water-obsessed cat named Ellie. Live the Stories is a great resource for ministers and lay leaders responsible for leading worship. Andrew, taking seriously the role of children’s sermons in worship, engages the entire congregation and challenges worshipers of all ages to find their place in the stories of our faith. I have had the privilege of participating in many of these children’s sermons and have enjoyed watching the young and the young at heart come together to provide visible, tangible examples of the stories that shape the people of God. Andrew Noe’s approach to life is one of joy, and his new book, Live the Stories, is no exception. These fifty stories are creatively designed to help you interact with the Bible with childlike wonder while playing with children in new ways in order to share the stories of our faith. Andrew has provided a flexible and pleasing way to play with the Bible stories of our childhood again. You will have fun using this resource!